The municipal potable water system we have now is appallingly inefficient. We can improve the efficiency of our supply using simple, straightforward, low-tech solutions right in the home. These can save us a great deal of water–and money. 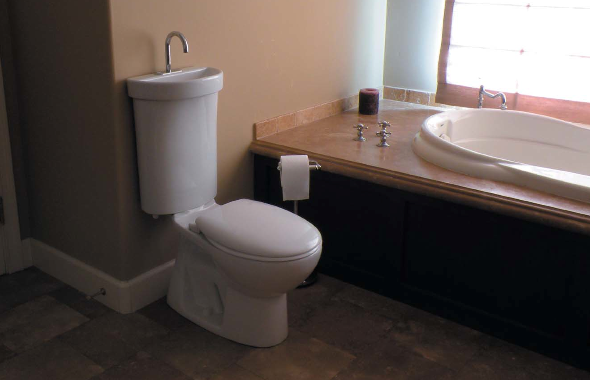 At the very simplest level, aside from the installation of high-efficiency toilets (which can yield enormous returns, as we’ve seen in the City of L.A.), a homeowner can install toilets that incorporate hand sinks into the tank cover (such as the Caroma Profile Smart 305). This would mean that water used for washing hands would also be used for toilet flushing; a kind of partial greywater system right in the bathroom; an easy and efficient way of using the same water twice. Another uncomplicated piece of equipment is a recirculating hot water demand pump that makes hot water available almost immediately when taking a shower or washing hands. I’ve seen independent estimates that such pumps can save over 1000 gallons per year per dwelling unit, which can yield significant savings. Tankless water heaters, another often-recommended item, actually can increase water usage by supplying a seemingly endless supply of hot water, thus encouraging long showers, for example, so installing such a water heater also requires that family members be alerted to the downside of long showers. There are new products that monitor and alert individuals when their water use exceeds some pre-set standard, through various forms of alerts. For example, the Sprav shower monitor provides color-coded alerts when certain levels of water use are reached. The current estimate among experts is that 60% of residential water is used in landscaping. Changing the landscaping to a drought-resistant design can reduce water use (and costs) significantly. For example, replacing the lawn in a 3,000 square foot yard with water-wise landscaping can reduce the monthly water bill by $160-$250. More importantly, doing away with the lawn is a big environment-friendly step that benefits the entire community by saving large quantities of drinking water. These all may seem relatively trivial, but as we’ve seen with L.A. City’s toilet replacement program (which reduced L.A.’s per capita water use to the lowest in the country for cities with more than 1 million residents, saving 14 billion gallons of water a year), simple measures can yield dramatic improvements. There are many things that can--and should-- be done easily right away. More information (including water-savings calculators) can be found in the EPA's WaterSense web page.